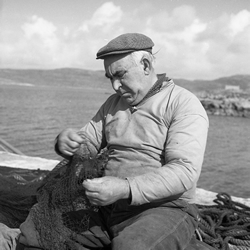 Dr Robertson worked as one of two physicians on South Uist for 25 years from 1956 – 1981. He joined Dr Alasdair MacLean and a wonderful team of staff to establish a comprehensive health care service in the newly extended Sacred Heart Hospital in Daliburgh. He had always been a keen photographer and with his Leica and Rolleiflex cameras he set about recording the people and their rapidly changing way of life. To process the camera’s film and print photographs was challenging without proper facilities. He set up a darkroom in the coal cellar of the family home at 15 Kenneth Drive, Lochboisdale. It wasn’t ideal and was small and very cramped. In the dark, he accidentally hit his head on the old conical fire extinguisher that hung on the wall which then began making worrying noises. Thinking that it was about to go off, he grabbed it and hurled it into the garden. Unfortunately it landed on the trigger that set off the foam just as the neighbour opened her door to see what all the commotion was. Foam spouted out from the extinguisher straight passed her and into her house. After much apology a new location for the darkroom was found – the small cupboard under the stairs which he used for 9 years before finally getting a dedicated darkroom in the attic of the new family home in Daliburgh where he continued to process the thousands of photographs that he took of the people and landscape of the southern islands of the Outer Hebrides. Sadly, Dr Robertson died in 2006 but his archive of wonderful photographs remains. Plus 2 books recently published by The Islands Book Trust. "Dualchas araid agus priseil" and "Oighreachd ar Sinnsearan"
(The books, website and Facebook page in general each show different photographs).